Minnesota Network of Hospice & Palliative Care (MNHPC) is the state's leading hospice and palliative care network. We bring providers, business partners, and individuals together to increase knowledge, access services, and strengthen advocacy for people living with a serious illness or experiencing the end of life. Thirty-eight years strong, MNHPC is directed by nurses, doctors, clinicians, and community leaders passionate about the value of palliative and hospice care. Our work is helping to shape the future of how palliative and hospice care services are offered and delivered. 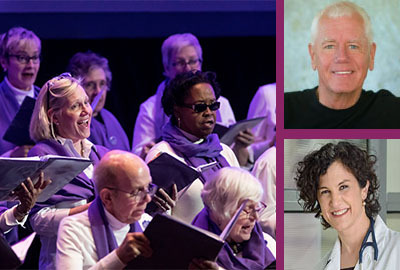 "Being Present: a conversation about humanness through life's end"
MNHPC invites you to join us for an evening that will inspire, engage and challenge, with Dr. Jessica Zitter, Frank Ostaseski, and Giving Voice Chorus. Health care professionals in the Rochester area are invited to a free workshop on Monday, April 1st. The training will be an overview of topics such as hospice and palliative care, advanced care planning, veterans' benefits, and the trajectory of serious illness. The training is free, but advanced registration is required. Learning that you or a loved one has a serious illness or is facing the end of life can be overwhelming. Click the button below to learn more about hospice or palliative care, to find a healthcare provider, or to connect to resources for individuals and families facing serious illness or the end of life. MNHPC is the state's leading hospice and palliative care network. We offer a variety of programming for hospice and palliative care professionals. Click the button below to learn more about educational and advocacy opportunities and to access resources for hospice and palliative care professionals.